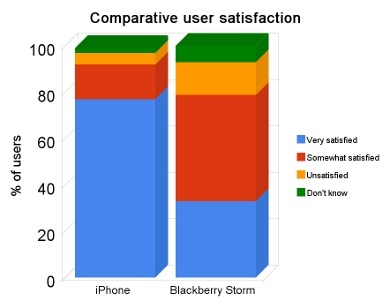 The chart above, generated from data produced by two ChangeWave surveys (iPhone survey here, Blackberry Storm here), shows user satisfaction levels among iPhone and Blackberry Storm owners a month after purchasing their device. The blue area in each stack corresponds to users who were ‘very satisfied’, red is for ‘somewhat satisfied’, yellow is ‘unsatisifed’ and green is for those who couldn’t say either way. So, for the purposes of this analysis, more blue and less yellow equals a better result. In July 2007, a month after the launch of the original iPhone, 77 percent of users awarded the device the highest rating of ‘very satisfied’. In contrast, only 33% of users awarded this rating to the Blackberry Storm when ChangeWave conducted a similar survey in December 2008. If we look at the ‘unsatisified’ rating, this accounted for just 5 percent of iPhone owners, but 14 percent of Blackberry Storm customers. To compare this another way, almost 2.5 times as many iPhone users were very satisfied with their device and almost 3 times as many Blackberry Storm users were unsatisfied. Both companies benefit from fiercely loyal existing user bases, both companies were launching their device as an exclusive product on a single network and both companies benefited from significant media coverage in the run-up to release. So, what has gone wrong for the Storm? Delve deeper into ChangeWave’s survey and we find some other interesting results, notably around the popularity of the touchscreen on the Storm. Despite being marketed as the device’s main feature, some 20 percent of users cited it as the feature they liked least after spending a month with the handset. 21 percent chose the absence of a QWERTY keyboard, which was sacrificed to make way for the touchscreen, and another 20 percent thought the Storm’s biggest problem was being ‘difficult to use’. The survey neglected to mention the numerous software glitches afflicting the initial Storm devices (which are now being slowly fixed by over-the-air updates), but it is not hard to imagine these contributed significantly to the 20 percent who found ease of use to the be the major weakness. Touchscreen devices are set to dominate industry headlines for the next 12 months. In a recent interview with the Financial Times, Nokia’s CEO Olli-Pekka Kallasvuo said his company – for a long time the least enthusiastic supporter of touchscreens among the major manufacturers – would reverse this position in 2009, going after competitors with a ‘vengeance’ by launching a wide range of new handsets with this feature. As the industry prepares for a huge surge in touchscreen products, what mobile user experience lessons can we learn from the Blackberry Storm? – Touchscreens are just components – they do not represent an experience in themselves. – Tweaking an existing platform and adding a touchscreen will not deliver a revolutionary new set of products. – Touch interactions are fundamentally different from those performed with keys or even a stylus, and will often require a completely revised user interface. Nokia, which has been busily skinning Series 60 in preparation for the introduction of touchscreen products, would do well to take note. – If you start your product design process with the premise of ‘we need a touchscreen device in our portfolio’, you can expect to end up with a bad user experience. – The mobile industry has made this mistake time and again, seeking to sell users the promise of a particular technology rather than focusing on how that technology can be applied to enhance the customer experience. – Touchscreens do not change the rules – remember, always start by designing for the user rather than designing around a technology. – Following trends will only take you so far and it is easy for a company to lose sight of the unique characteristics which have made it successful in the past, especially when trying to expand into new market segments. – In RIM’s case, it built its business on providing extremely reliable and easy to use products which are great at delivering an integrated email, messaging and voice experience. – The arrival of the iPhone has produced a new competitive threat and RIM is responding to pressure by launching a touchscreen product. – By launching too early, RIM has damaged its reputation with existing users and lowered the chances of customers acting as ‘ambassadors’ for its products. – RIM would have been better served by waiting until its smart designers had come up with a genuinely differentiated touchscreen experience, built around the connected platform principles which have made it successful. – For instance, video content works extremely well on a large touchscreen. RIM’s unique selling point for a device like the Storm could have been a connected video experience with the same reliability and ease of use as its email system. – The real innovation would have been in the back-end systems and client software powering this – the touchscreen would have been the component completing the experience. I’d be very interested to hear opinions from the MEX community on this. Why do you think the Blackberry Storm is failing to live up to expectations while the iPhone continues to impress users? What are the essential ingredients for a great touchscreen mobile user experience? Please post your comments to the blog using the links below. Marek Pawlowski is the founder of MEX. Since 1995, he has focused the MEX business on helping digital industries to develop better, more profitable products through improved understanding of user behaviour with mobile devices and wireless networks. MEX is best known for its events, research and consulting, which balance commercial, technical and user insights to define the future of mobile user experience. Thank you Marek – I’m amazed at how few people in this industry get this point. The iPhone’s success has very little to do with its hardware, or its form factor, or the features it does (or doesn’t!) support. The iPhone works because it *works*. I’ve owned just about every smartphone released, based upon Symbian, Windows, Palm and Linux, and the iPhone is still the only one that delivers. I’m constantly amazed at the glowing reviews that supposed “iPhone killers” receive. A longer list of features is irrelevant if they don’t work. The sad thing about all of this is that the iPhone still leaves a lot to be desired. I have experienced crashes, lockups, silent calls and many other problems. Objectively viewed, it’s nowhere near the quality we should really expect. And yet it’s still head and shoulders ahead of anything else. Marek, you’re right on. UX is about the right interface at the right time, “right time” being defined as “the needs of the task at hand”, not “the tech darling of the year”. It’s what Apple did right — the whole UI experience, with the touchscreen serving the need, not vice versa. Thanks Marek – your post was timely for me. I was just finishing off a post about why 2009 is the year of the touchscreen, and why the iPhone user experience means Apple are probably not overly concerned about the increasing competition. One thing I did not mention about Nokia though – with S40 devices taking touchscreen into the lower-end, will the perceived value and cachet of the iPhone be diminished? Probably not, as Apple are not following a whole-market strategy, and their devices are available for free on some tariffs. But you can bet that Nokia is going to sell a *lot* of touchscreen phones. Thanks to everyone for the thoughtful responses to this post. I’d particularly like to pick up on the point made by Noel about the ‘dual click’ of the Storm touchscreen. I omitted to mention this in the main article, but if you’re wondering what all the fuss is about and have not yet tried it for real, I’d urge you to visit your local Verizon or Vodafone store to do so. The screen senses two different types of input: first, a light touch selects a particular area or icon and then an actual ‘click’, where the user presses hard on the screen, is required to confirm the selection. My understanding is this was implemented primarily to provide tactile feedback for the virtual QWERTY keyboard and make it into a more familiar, Blackberry-style user experience. Personally, I didn’t find it too much of a problem for the relatively small amount of time I spent testing a Blackberry Storm, but I know it has become frustrating for many customers who are using this as their day-to-day device. I am generally very positive on mechanisms which add tactile feedback to the touchscreen experience. The latest generation of haptic-enabled devices are able to provide a wide range of different feedback sensations localised to particular areas of the device screen. However, RIM’s implementation on the Storm seems to eschew this sensitivity in favour of a much cruder, single push sensation. I also have concerns about the longevity of this mechanism and can foresee a high failure rate because of the pressure required for each click. Matt Radford makes an interesting point about the potential shape of the market once touchscreens become more commonplace. As Sarah and Paul both picked up on, the iPhone has succeeded not because it has one of the best touchscreens in the market, but because it comprises a complete package of experience. It is by no means perfect (and it is worth noting both of the ChangeWave surveys were conducted in a ‘honeymoon’ period immediately after launch), but for most users it seems to provide an experience which exceeds their expectations. By starting with a set of user goals and building a device which met them, Apple has ensured it has a motivated, loyal and active customer base out there demonstrating the virtues of their device to others, recommending to friends and primed to buy the next generation of iPhone when it arrives. Great update with the satisfaction surveys and analysis to conclude that interface and overall user experience are much more important than any components taken individually. another good analysis of Marek of a famous industry subject “user experience”. Unfortunately most people understand “user interface” – but that’s just a very small part of it ! To me the iphone is one of the few products which were developed form the customer perspective. This linked with the “Apple” brand makes it cool and the user proud of it. The major part of the mobile industry is focused still on adding one technology to the other one – me projection is: the future will be about integration ! And there is MUCH to do ! The iphone is just the start ! Great article – I’m also surprised by how many people are unable to recognise is UX that differentiates the iPhone from ANYTHING else! Being a bit of a die-hard S60 fan I am very disappointed with the scale of the modifications Nokia have made to S60 in order to implement touch – visually and functionally. A missed opportunity to really bring the user experience up to 2009 levels. They have failed to truely address the user experience, something dating back nearly a decade to past S60 versions, along with (importantly) the effective use of touch. I’m also disappointed that Nokia are reserving one of the significent enhandements, homescreen widgets, for the N series only – this is more of an essential (an not exactly revolutionary) functionallity these days. I am a S60 fan and really don’t think i counld bring myself to buy an iPhone as it’s far too restrictive now I’ve lived S60, but the iPhone UX is something that Nokia obviously doesn’t understand. Great post. I think your points are right on. To their credit, though, I think RIM did do a number of things right in designing their touchscreen UI, but the whole system just doesn’t work together well. Everything is too slow, for one thing, which makes all the interaction suffer. The clickable screen, though flawed, is an interesting innovation that we’ll probably see more of. The bottom line is that they either didn’t test the final system with users or they did but they ignored the results instead of iterating on the design. I love this review and I think I will use it to my advantage to convince our marketing guys. But I beleive a lot of this controversy is our own fault (of hte industry). I remember the debates we had in the industry about touch screen and how good tactile feedback was and that is why physical would always be better than touch screens, etc. Then we discovered that touch screen allow a more direct interaction model, more object oriented and we started to consider touchscreens a good alternative to ‘mouse pointing interfaces’. We actually made some good touch interface products. But we had difficulty convincing our product managers to make touch screen products. It was expensive and Apple didn’t need one to be succesful. Then iPhone and iTouch came out and all debates and discussions stopped. Touch was GREAT we all had to have it. So everyone kind of lost their profesional scepsis and blindly put touchscreens on all products even when the value propositions and use cases for certain users clearly had no benefit from having touchscreen, as the blackberry case clearly shown. So please let’s start thinking for ourselves again and stop copying Apple. There are still users who should not use a touchscreen as it is for their usage less uasable and interactions get flawed resulting in poor UX. Get some good old fashioned user centered thinking again and create a user experience that answers the users needs and not some marketing whim. Like I always say, if you don’t know why you do something then don’t. I use a Palm Treo 680 and like the fact that I can do some things with touch screen but am not tied to it. Certainly for text input there is no way I would switch the qwerty keypad for an oncreen one. How do you make a call on a bright sunny day for example? Founded in 1995 by Marek Pawlowski, MEX is home to an ever growing library of 1598 articles, videos and podcasts exploring emerging technology, user behaviour and how to design better digital experiences. Please get in touch with any questions. Dollar and Euro amounts are approximate and may vary according to exchange rate.